Celebrating its 20th anniversary, Nippon Ichi Software, makers of the the Disgaea series, will be releasing Kamisama to Unmei Kakumei no Paradokusu (The Paradox of God and the Fate Revolution) on the PS3 next week. The game was announced last year, and was originally slated to hit stores in Japan on December 20th, but was delayed for a month. Now, after the extra wait, the new paradoxical game is ready for release. 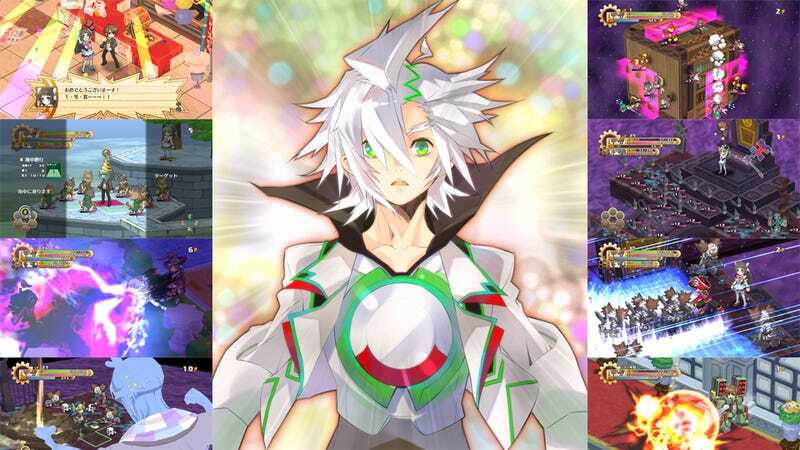 The game follows Renya Kagurazaka, a high school student who is chosen to be a god by winning a marketplace raffle (already, the Disgaea-style insanity is apparent), and his task is to "make people's wishes come true by revolutionizing their fates." Renya goes through the process of revolutionizing people's fates by navigating "copy-world dungeons" that are based on the fate in question. One of the people who come seeking a revolution is the fairytale princess, Cinderella, who has grown tired of her happy ending. Renya is supported by 7 angels (designed by Haruhi Suzumiya character designer, Noizi Ito) of varying personality as he navigates the myriad of dungeon fates/worlds. The game system is a standard dungeon crawler, much in the vein of Chocobo's Mysterious Dungeon, Pokemon Mystery Dungeon, or Shiren The Wanderer. Basically, players start at level 1 when they enter a dungeon. Every action taken, be it moving, attacking, using an item, etc. is done simultaneously with enemy actions in a turn-based manner. Dungeon maps are randomly generated with different enemies and traps scattered throughout. Levels are gained in standard RPG fashion, but every time you exit or clear a dungeon, your level is returned to 1. Depending on your performance during your exploration, special bonuses are acquired that allow for greater status increases when you level up in following dungeons, making you stronger each time around. Items and equipment are also retained. The game also includes Nippon Ichi Software's unique trademark elements, like the ability to pick up and throw things (and characters), massive levels of customization leading to insanely high statuses and equally insane damage numbers (I remember back in the day when you were ecstatic when a character could do 3-digit damage… Oh, and get off my lawn). You will also be able to take ally angels to explore dungeons with you, which adds a greater level of strategy to the game. Kamisama to Unmei Kakumei no Paradokusuis scheduled for release next Thursday (January 24th) on the PlayStation 3 in Japan. No information on international or other platform releases has been made available.